The addition of a fast auxiliary power source like a supercapacitor bank in fuel cellbased vehicles has a great potential because permits a significant reduction of the hydrogen consumption and an improvement of the vehicle efficiency. The Energy Management Strategies, commanding the power split between the power sources in the hybrid arrangement to fulfil the power requirement, perform a fundamental role to achieve this objective. In this work, three strategies based on the knowledge of the fuel cell efficiency map are proposed. These strategies are attractive due to the relative simplicity of the real time implementation and the good performance. The strategies are tested both in a simulation environment and in an experimental setup using a 1.2-kW PEM fuel cell. The results, in terms of hydrogen consumption, are compared with an optimal case, which is assessed trough an advantageous technique also introduced in this work and with a pure fuel cell vehicle as well. This comparative reveals high efficiency and good performance, allowing to save up to 26% of hydrogen in urban scenarios. Feroldi, D.; Serra, M.; Riera, J. 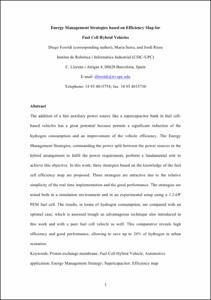 Energy management strategies based on efficiency map for fuel cell hybrid vehicles. "Journal of power sources", Maig 2009, vol. 190, núm. 2, p. 387-401.